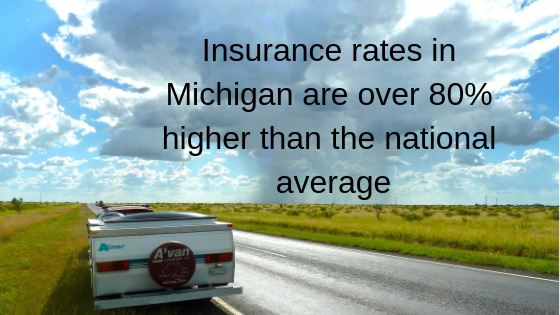 Insurance rates in Michigan are over 80% higher than the national average. The amendment states, among other things, that there will no longer be a redundant requirement for both automobile insurance and personal injury protection when the driver already has coverage for injuries in the event of an automobile accident. Section 3107c of Senator Nesbitt’s bill is intent on giving the option to forego personal injury protection to seniors over 62 years old who have lifetime health care benefits. This will reduce the strain on the people by not requiring them to have personal injury coverage in automobile accidents when they already have it from another plan. This is likely to have a positive impact on the consumer since it serves no purpose to have two insurance plans for the same thing. Section 3109B of the bill describes the other application of the new law that allows automobile insurance policyholders to choose an amount of personal injury protection coverage that more closely matches their particular needs rather than requiring blanket coverage. The focus of the bill is not on helping the working class in particular; rather it seems to strive for an impact on the overall system as a whole by striking at medical cost inflation. It is claimed that inflation of these medical costs is shooting up at a high rate due to no-fault insurance claims that result in the victim receiving expensive treatment, training, product, service, or accommodation paid for by the insurance companies, which in turn raises the costs for us all. One criticism of Senator Nesbitt’s proposal is for a section that seeks to limit the payout accidental bodily injury victims could receive. It says that any service, treatment, training, or accommodation a person receives for an accidental bodily injury will be limited to an eligible reimbursement of not more than a reasonable payment for those services received. This puts a cap on the amount potential accident victims can receive and anytime a cap is involved, there is also a limit to the medical services that can be received. There are practitioners who inflate the price of treatments to benefit their practices. That is clearly what the bill is seeking to stop with the overall goal of slowing rising insurance costs, but critics ask whether this is the best route to tackle it. They ask whether the state should be getting involved in what medical professionals can prescribe. There will certainly be extreme cases where an unusual amount of rehabilitation is required or perhaps a complication that doubles or triples the cost of treatment. Will these cases be forced to stop treatment halfway through because they pay for their insurance every month, but they are now limited to a “reasonable” amount? Is This a State Legislation Issue? There is a lot to consider in Senator Nesbitt’s bill and more libertarian critics dislike any time the government attempts to step in and intervene in a free economy. They suggest that last time the government stepped in, the banks that were practicing criminal malfeasance got a bailout, and the homeowners and retirements with savings in the market got the short end of the stick. Nesbitt’s attempt to assure those that they won’t be refused medical care because their insurance limit is reached is section 3157A which guarantees an independent third party will review the treatment based on medically accepted standards. It makes a special provision for medical providers that knowingly provide false or misleading information. This is clearly their safety net to curb inflation due to reporting exaggerated costs. Whether Senator Nesbitt’s bill will actually have the intended effect of curbing insurance inflation remains to be seen. For now, residents of Michigan should review the bill and not hesitate to voice their own opinions on the matter.